Duke Energy recently announced its support for Charlotte Teachers Institute (CTI) with a $20,000 grant to fund an energy-related seminar for Charlotte-Mecklenburg Schools (CMS) teachers, as well as two special events for the public this fall. Duke Energy is sponsoring “The Global Energy Challenge,” one of CTI’s eight, long-term seminars in 2014. The two Duke Energy supported public events are: “Teachers as Scholars: The Nature of Energy” on Tuesday, Sept. 30, at the EnergyExplorium at McGuire Nuclear Station, in partnership with Piedmont Natural Gas; and “Exploding Canons: Under the Lake” on Tuesday, Oct. 21, at Davidson College. The Exploding Canons program explores the changing social and physical landscape of Lake Norman over its 50 year history. Both events are free and begin with a reception at 5:30 pm, followed by presentations from 6:30 to 8 p.m.
“Duke Energy commends the more than 100 teachers who will spend much of their free time this summer and fall participating in the Charlotte Teachers Institute,” said Richard “Stick” Williams, president of Duke Energy Foundation. 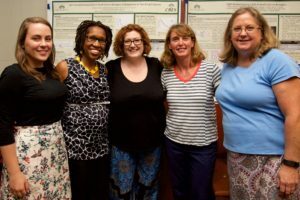 “These dedicated educators are being exposed to content-rich ideas and are developing curriculum that will benefit students in Charlotte classrooms and beyond. We are proud to support the work of the Institute,” Williams said. CTI seminars began in April and continue until December, with 104 CMS teachers participating. These CTI Fellows work closely with university/college faculty and each other to create new curricula designed for their own classrooms, with an expected reach of 15,000 CMS students in 2014-15. “CTI’s collaborative seminars deepen teachers’ understanding of the subjects they teach, and help them think critically and creatively about academic objectives – with their own students in mind,” said CTI Director Scott Gartlan. This year’s CTI seminars take place at Discovery Place, the Gantt Center for African American Arts + Culture, Davidson College and UNC Charlotte. The Duke sponsored Energy seminar is on of the four seminars at Discovery Place. Posted on August 27, 2014 by Robin Mara. This entry was posted in CTI News, News, Press Releases. Bookmark the permalink.